Oh yes, they're back. 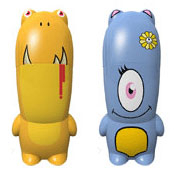 If the first set of Mimobot USB drives didn't hold you over, you're going to love the 2GB versions. Isodore and Fairybit are joined by some plainer-looking protobots in black and white, and they'll only run you $189 at www.mimoco.com. So come and get' em!